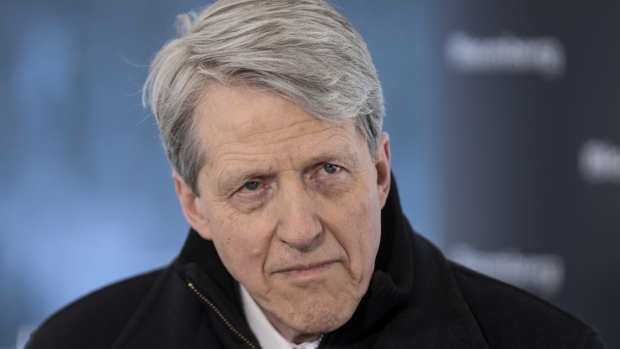 (Bloomberg) -- Recession risk is real, according to Nobel laureate Robert Shiller, and one might come as soon as this year. Whether the U.S. will experience a contraction has become one of the hottest debated topics among investors amid uncertainty surrounding U.S.-China trade talks, deteriorating earnings forecasts and slowing growth around the globe. The ambiguity caused the almost decade long rally in U.S. stocks to come within a whisker of its end in December. The ongoing debate makes it all the more important to focus on how the markets are interrelated, said Jeffrey Sherman, DoubleLine Capital LP’s deputy chief investment officer. Rates are higher compared to recent history, we’ve seen margins compress a bit, and it’s possible GDP growth slows down to trend -- closer to 2 percent, he said. When it comes to investing, everyone needs some stocks in their portfolios, they just have to be "more cautious," Sherman said during the panel discussion. "You have peak earnings and peak euphoria," Sherman said. "The question becomes, how does corporate America respond at this stage? It doesn’t look horrible." Shiller and DoubleLine have a long relationship. The DoubleLine Shiller Enhanced CAPE fund puts the majority of its investments into a fixed-income portfolio, while at the same time employing derivatives to gain exposure to large-cap equities that are undervalued based on an index created by Shiller. Launched in 2013, the fund’s five-year track record puts the product in the 99th percentile when compared to peers, according to a Bloomberg ranking. The cyclically adjusted P-E ratio (CAPE), which Shiller developed 30 years ago, uses 10 years of earnings in its calculations to gauge stock market valuations. Right now the measure comes in around 30, which is “quite high” according to Shiller, especially considering that’s about double the historical average. Going forward, though, the ratio should come down just because of time -- the worst earnings during the financial crisis should fall out of the equation soon. “That doesn’t mean you expect negative returns,” Shiller said.